The "What's In-Die Box" is Australia's first indie nail polish subscription box. 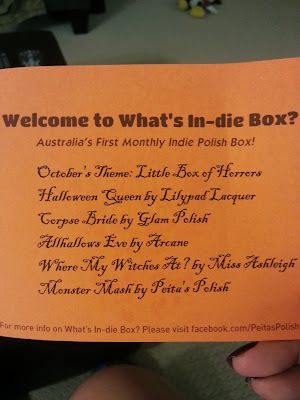 Each box is centered around a theme (this month the theme is "Little Box of Horrors") and contains 5 exclusive polishes from Aussie indie brands. The great thing, for me at least, is that they ship internationally! 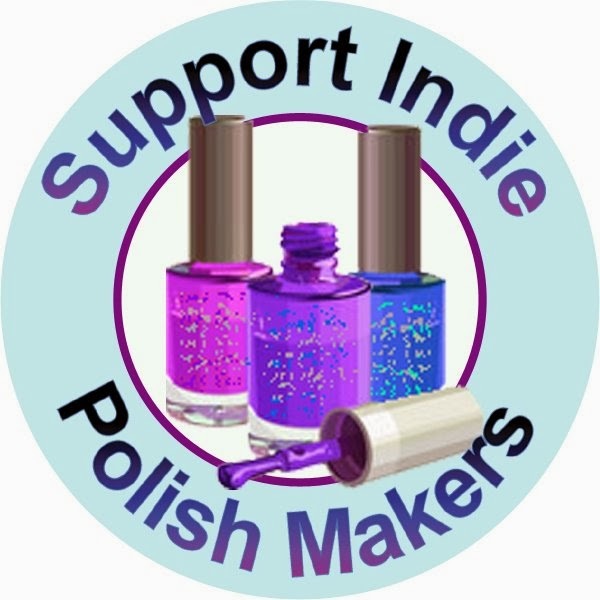 It's a little more expensive because it's sent with tracking but, for the quality and the access to hard-to-get polish, I think it's a great deal. The cost each month is $47.99 and shipping to Canada was $20. 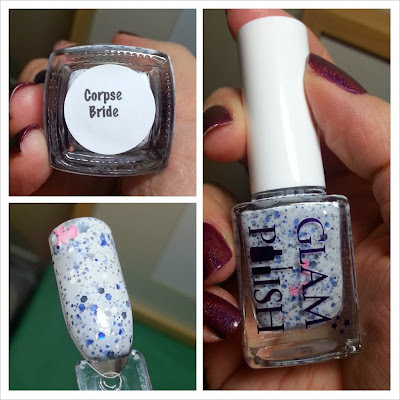 The last several months it has been curated by Peita's Polish and the November box is currently for sale on her Big Cartel store. Let's move on to the contents. 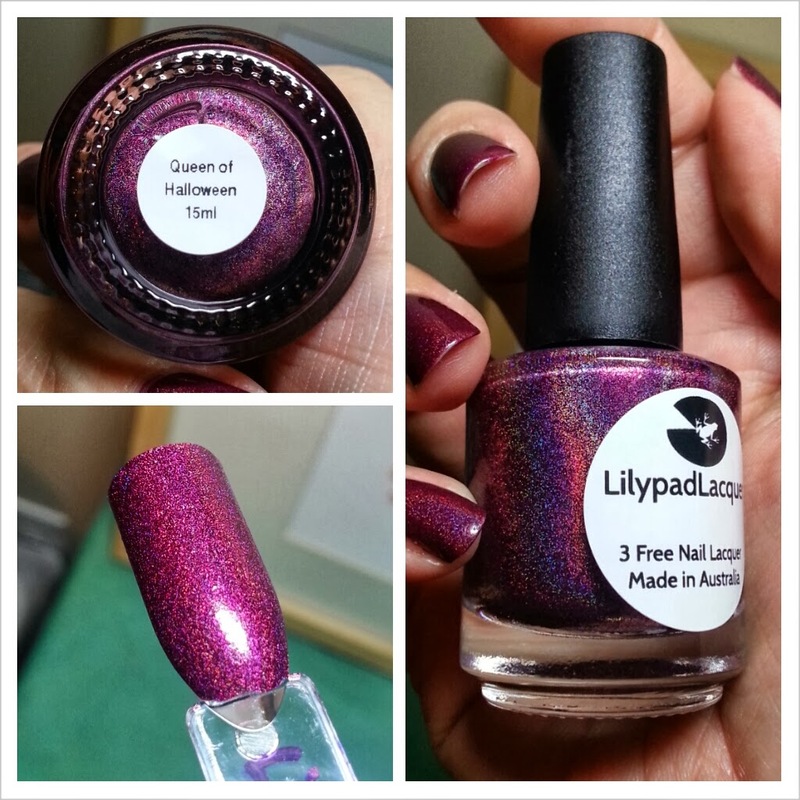 Queen of Halloween from Lilypad Lacquer - a lovely berry/burgundy holo. Looks similar to Enchanted Polish Mr. Burgundy but I'd have to swatch them side by side to check. Swatch is two coats. Corpse Bride by Glam Polish is an off-white/light grey creme that has blue, black and silver hex glitter as well as pink skull glitter. Swatch is two coats. 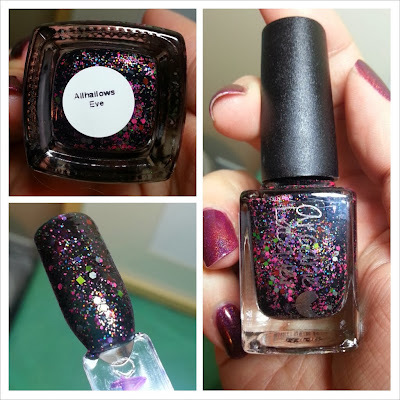 Allhallows Eve from Arcane Lacquer has a sheer black jelly base silver, purple, and pink hex glitter, chartreuse small square glitter, and pink, silver and teal micro-glitter. The swatch is three coats but might be best worn over black. Where My Witches At? 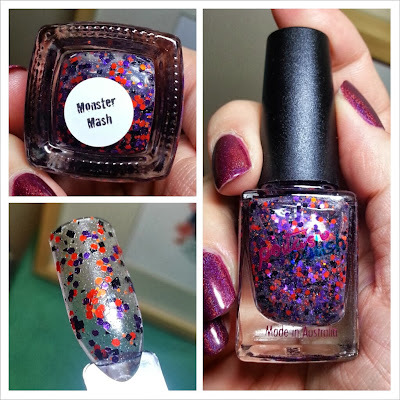 by Miss Ashleigh has a sheer purple jelly base with purple hex glitter in different sizes, small teal square glitter, tiny teal and purple hexes, red shards and holo micro-glitter. Swatch is three coats. Last but not least, Monster Mash by Peita's Polish is a clear glitter topper that contains orange and purple hexes, black squares and shards, a tiny amount of small black bars and holo micro-glitter. Swatch is one coat. All in all, I'm super happy with my first "What's In-die Box" and while I won't be purchasing one every month, if the theme catches my interest I will certainly be ordering in the future. Keep in mind that these are all exclusive polishes and won't be sold anywhere else! You can order November's What's In-die Box, the theme of which is Rock and Roll, here.